The military parade to mark the 60th anniversary of China's navy is not just a chance for the Chinese to celebrate. It is also a reminder that China is now an important naval power - and will become more important in the future. Its military leaders openly admit that they want to build bigger, better warships for missions far away from the country's coastal waters. But despite improvements in recent years, analysts say China's navy is still not able to compete with the world's leading powers. "In no way is the Chinese navy on a par with the United States - or even Japan," said Bates Gill, an expert on the Chinese military. China has become more assertive in its aim to establish its sovereignty claims over a string of islands to its east and south. This has led to arguments with, among others, Japan and Taiwan, a self-governing island that China says must be reunited with the mainland. China also has to consider the US, the region's pre-eminent naval power and Taiwan's main source of military and diplomatic support. "This has placed huge demands on China to focus on its maritime capabilities in a way that it has not been asked to do before," said Mr Gill, director of the Stockholm International Peace Research Institute. 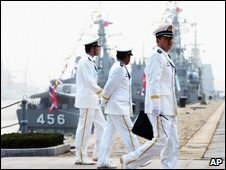 China is also keen to use its navy to project its power further abroad, particularly to protect the country's trade routes. This is made clear in the country's latest report on its military forces, entitled China's National Defence and published at the end of last year. "The navy has been striving to gradually develop its capabilities of conducting co-operation in distant waters," the report says. China despatched a small flotilla to the Gulf of Aden in December to join an international effect to combat piracy, particularly off Somalia. Analysts see this as evidence of China's willingness to operate in waters far from home - and its ability to do so. To carry out these missions China wants bigger and better warships, a point made by the navy's commander-in-chief, Admiral Wu Shengli, last week. China seems particularly keen to have an aircraft carrier - a warship that has symbolic power as well as practical uses. There has been intense speculation over recent months that Beijing will soon announce its intention to develop its first aircraft carrier. It is an issue touched upon in the US Pentagon's annual report to Congress, published recently, about China's military capabilities. The report says that China has an aircraft carrier research and design programme, and is interested in buying carrier-borne aircraft from Russia. 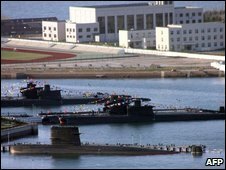 But at the moment China does not have such a vessel, despite the great strides made by the navy over the last 10-15 years. The Chinese navy managed to circumnavigate the globe only in 2002, nearly 100 years after the US Great White Fleet completed the same task. Andrew Yang, chairman of the Chinese Council for Advanced Policy Studies in Taiwan, said Chinese ships were mostly inferior to US ships. He said China had just two advanced Type 051C destroyers, which are fitted with cutting-edge air defence missile systems. Mr Yang added: "These ships are not combat proven. We don't know how capable the Chinese navy is, even if they have the weapons." But perhaps all this misses the point of this week's naval parade. As military analyst Dennis J Blasko makes clear in a recent article, this show of force will in itself act as a deterrent. "The mission of the Chinese armed forces is not only to be prepared to fight wars, but also to deter or prevent their outbreak," he wrote.